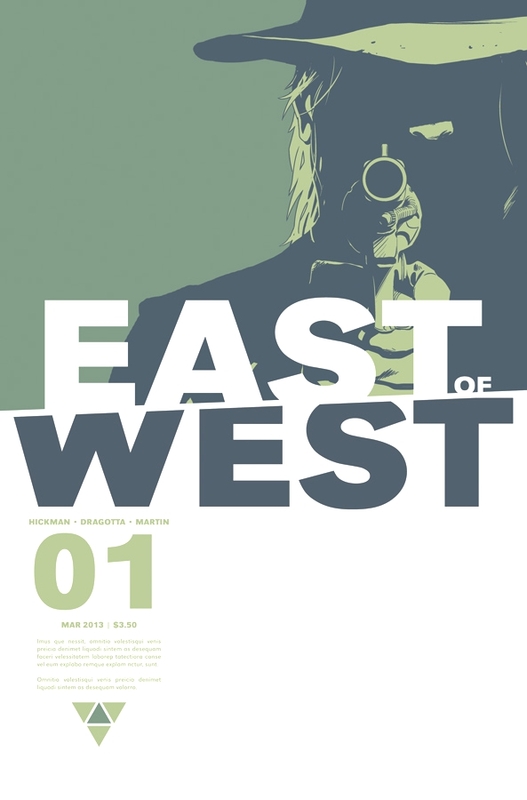 East of West by Jonathan Hickman and Nick Dragotta immediately forges itself as a comic hinting at the familiar before delving far into the bold and different. This off-number group of apocalyptic heralds is born into a world seemingly like our own world, to a point. The American Civil War to be precise. It was as this time that a Native American empire was forged to rival the Union and Confederacy. A 3-part prophecy arose in disparate cultures. A stone missile from the heavens ravaged the lands. This is not our world in short. America has been divided in the wake of the meteoric assault and generations of violent battles and bloodshed. A perpetual western frontier has established itself and the Sergio Leone film post-war tension rides as high as the level of technology filling the saloons loaded with soldiers whose American Civil War uniforms have evolved to the Moebius-esque vibe of slightly exaggerated pompous hats, which wouldn’t feel out of place in Arzach or Le Garage Hermétique. The world building here is under-stated but lurking meaningfully beneath the surface. Racial tensions are an absolute high, and the integration of technology into society is uneven. In the frontier buildings are slapped onto the side of cliff faces dotting the barren lands. In the cities monolithic towers of sleek white dwarf lesser black skyscrapers of an older, more cynical design. The blood-flow of the metropolis is a never-ending stream of flying traffic, a stream whose constituents are rectangular vehicles of maximum ergonomics and products entirely of unimaginative function. Further in the frontiers life is messier. Vehicles must adhere to the brown earth. Their shape conforms an old-world style resembling the creatures humans once used in place of technology. The horse-form robotic steed simultaneously feels more archaic, backwards and far less functional then the city-vehicles but infinitely more preferable for the rustic sense of style of the clunky rigidness of the gravity defying boxes encircling the skies. This might be the best work of artist Nick Dragotta’s career. The smiles plastered across the children of the Apocalypse rivals a sense of horror and dread akin to horror-master Frazer Irving. As War, Famine and Pestilence pile high a mountain of corpses to frolic about on the creeping uneasiness oozes from the page. A pouting child on top of a legion of slaughter is an image hard to forget, yet the casual body language depicted amidst the horrors worms is way in deep to produce an disconcerting dissonance as you feel yourself naturally endearing to an upset child against all evidence of the devastation it just wreaked as the personification of War and the Apocalypse. The casual character-horrific action contrast plays well in the mid-comic bar scene. The evisceration of several soldiers by associates of Death, the white riding cowboy of the tale, is left unseen. Instead we get sunken-shoulder Death listlessly and lethargically throwing back a drink while the bartenders tortured and twisted face suggests the abominable violence happening in front of the panel. The backgrounds are loaded with onomatopoeic sound effects of screams, tearing flesh and roars of pain. This incorporation of visual and synesthetic audio cues to terrify the audience without displaying a single blow of violence highlights strengths of medium that Hickman and Dragotta know well how to implement. In a world where comic book adaptations hog the spotlight from their source, it’s always refreshing to see genuine love and use of the medium’s exclusive strengths drip from the page. 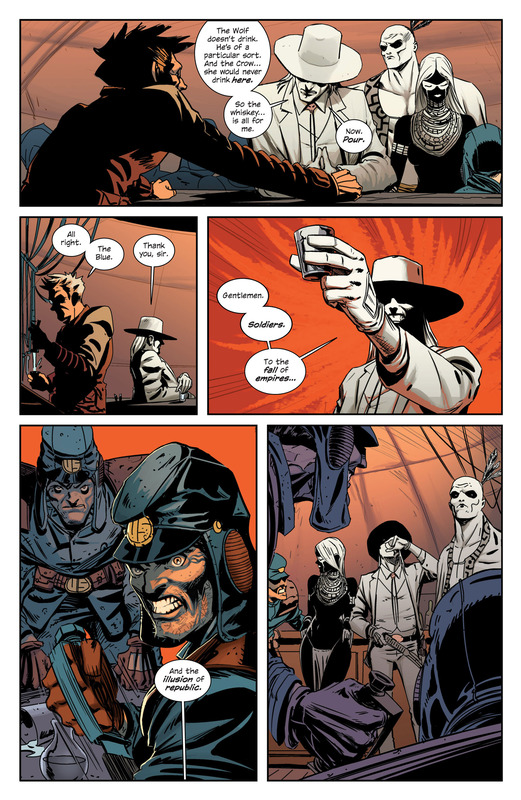 Dragotta pairs well with colorist Frank Martin who brings great warmth and texture to the brown and orange frontier, compared to the glossy, glowing or clean sterility of the high-tech side of society. The true nature of Death’s goals remain elusive to us so far, but revenge against those who sought to destroy him is a promise of what’s to come as he confronts the President of the United States himself. Just what led to the point of his ruination and how his fate will play out from here is a mystery but the promise of “End Times” to come and the delivery of what the world deserves is something I’m happy to have served up to me in time. 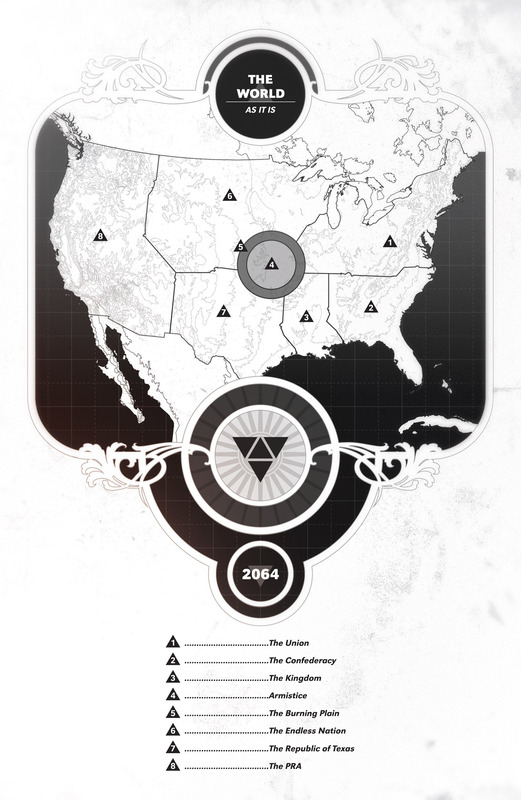 Plus, as long as Hickman draws maps and charts I’ll be buying. He’s the cartographer of the industry right now, road-mapping where comics should be and will be heading. Don’t get lost.